Hyundai Motor, South Korea’s No. 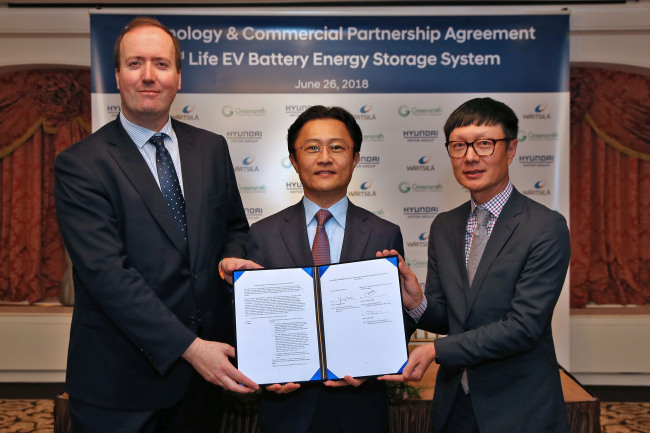 1 automotive company by sales, has signed a strategic partnership with Finnish energy firm Wartsila to tap into the energy storage systems market by utilizing used electric vehicle batteries, the company said Tuesday. The move is aimed at securing future growth, while dealing with environmental concerns over used electric vehicle batteries. Hyundai said it is expected to start development of ESS products for industrial use in 2021. “Much spotlight has been put on ESS as a new energy due to increasing concerns over potential environment pollution and unstable energy supply. We hope to obtain future growth engines in the emerging market, and foster EV sales with the partnership with Wartsila,” said Chi Young-cho, Hyundai Motor Group’s executive vice president and chief innovation officer of the group’s strategy and technology division. An ESS stores and supplies electricity when needed. It is used in households and for industrial use, contributing to a stable power supply. With the rise of electric vehicles that are powered by high performance lithium-ion batteries, ESSs have also risen as a prospective business. Hyundai is the first carmaker to invest in making ESSs with recycled batteries that are no longer useful in fully powering EVs. The amount of reusable EV batteries is anticipated to soar in the coming years as the number of EVs grow. According to market research organization Bloomberg New Energy Finance, the amount of reusable batteries was 0.1 gigawatt hour in 2016, but will rise up to 29 GWh in 2025, among which some 10 GWh would be used by ESS. About 28,000 households use 10 GWh of power a month, and this is enough to charge over 155,000 units of Hyundai’s compact SUV Kona. Wartsila provides smart technologies and complete lifecycle solutions for the marine and energy markets. It manages facilities that produce 67 gigawatts of power, across 177 countries. Last year it acquired ESS systems firm GreenSmith Energy, which makes up more than 30 percent of US’ ESS market. Through the latest deal, Hyundai Motor seeks to get its hands on ESS planning and manufacturing skills, and know-how on construction and management of ESS products, the company said. In widening its pilot projects in the US and other countries, it aims to start developing industrial-purposed ESS products for commercialization by 2021, it added. Hyundai Steel, the steelmaking unit of Hyundai Motor Group, is currently carrying out a project constructing a 1 megawatt hour ESS facility using used batteries from Hyundai’s Ioniq EV and Kia Motors’ Soul EV at its plant in South Chungcheong Province.